I have applied for a business visit visa for training in the UK at one of our suppliers. I have already provided the invitation letter from my UK sponsor company and also the sponsorship letter from my Saudi Arabia employer. And I also provide my personal bank statement. What documents do I need to provide to satisfy the visa officer ? Your application has been refused in this particular case, because when going to assess whether you had sufficent means to support yourself during the trip, the ECO notice that your bank statements were (partly) in Arabic. As all documents are required to have an English translation, they stopped assessing you there. Obviously any new application will have to submit these documents translated. As you can see from the comments and other questions on this site, you should explain (with evidence) any irregular payments in to your account, especially large ones. You should also be aware that there may be more reasons your inital application would be refused - it was just that the untranslated statement was a show stopper, so no further assessment took place. 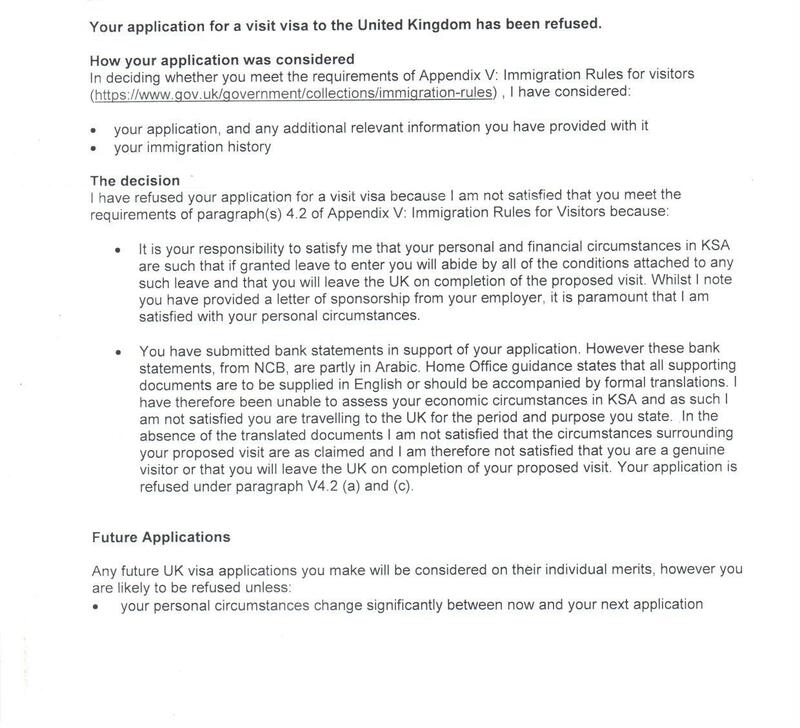 You should consult the offical UK government site and understand what is required and what the decision is being made on (UK visas are not a purely box checking exercise - providing all the required paperwork is only part of it, your paperwork also has to give evidence that you will leave when you say you will, not attempt to break the terms of your visa and can support yourself while in the UK).